October 10, 2017 – Omega World Travel and Cruise.com are proud to sponsor the City of Fairfax’s 41st annual Fall Festival. Come join us this Saturday, October 14 for live performances on three stages, carnival rides, over 400 craft and food vendors, children’s activities, and more! 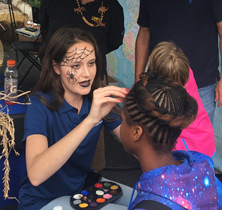 Stop by our booth next to the children’s stage for a chance to win two airline tickets and take advantage of our special cruise deals. Omega is excited to celebrate our 45th year in business by taking part in this hometown community event. In 1972, Gloria Bohan founded Omega World Travel as a small agency in Fredericksburg, Virginia. She opened the first Fairfax office in 1984, and now the city serves as the location for our international headquarters. Admission to the festival is free. Fees are associated with amusement rides, vendor purchases, and some activities. An ATM can be found on the corner of University Drive and Main Street. Food courts are located on University Drive both by Sager Avenue and by Omega’s booth at the SunTrust Bank parking lot. Parking is located at the Judicial Center parking garage B or Old Town Village parking garage. Handicapped parking can be found at the Old Town Village parking garage or at City Hall.